This is what many of us dream about: a home away from home, preferably near the water. This stunning collection of coastal abodes illustrates the beauty of being near the water. 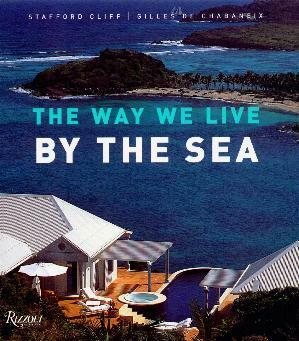 Astonishingly beautiful upscale homes as well as functional beach homes, huts, dwellings, villages, or distinctly remote settings all make up this beautiful book. Modern architects and developers are returning more and more to using natural resources when building new developments. Whether it's a home on a Greek island, the south of France, along the Norwegian coast, Tahiti, the Caribbean, Bali, the English coast, Cape Town, Madeira, or the Commores, these are exquisite examples of what can be created for those wishing the tranquility only found near the sea. The colors alone are breathtakingly beautiful - who wouldn't want to live in any of these places! I love islands so I feel naturally drawn to many of these places. Not only are homes featured, but also interiors reflecting the lifestyle, decorating with shells and pebbles, and living on boats afloat. My two personal choices are on pages 95 (Monte Carlo) and page 43 (Barthélemy), and the bedrooms on page 142 and the kitchen on page 108. Conclusion - Exquisite coffee table book.